We install, setup and administer wireless products from Ubiquiti. Ubiquiti offers a total end to end wireless solution and are the world's #2 wireless brand in market share. The offer enterprise quality wireless hardware at an affordable price with an easy to use controller and no ongoing licensing fees. Ubiquiti have a full range of products that suit small homes, corporate locations, large stadiums, point to point bridges and wireless links. 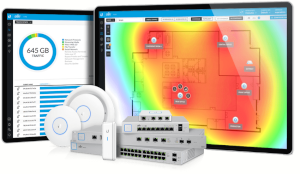 Their Unifi product line integrates access points, security devices, network switches, cameras and controllers together and is ideally suited for for corporate and business environments. If you are located in Adelaide or South Australia and would like a free no obligation audit to see if wireless and other products from Ubiquiti will benefit your business please contact us on 08 8326 4364 or via email at support@dpcomputing.com.au.